Just over a decade ago, I left a Mexico City teaching job and returned to England. In the school halls and side offices, a shift had taken place. Once a place of concerned listening and subtle nudging, parents’ evening had changed. Mums and dads wanted answers. Possibly because he does little else but doodle. Beautifully, mind you. His depiction of Lady Macbeth beheading her offspring was quite nifty, but he can’t put that in an exam paper I’m afraid. I was catapulted back into the system from which I had flown. Evenings lengthened; planning lessons became a test in computing. How many government initiatives could I squeeze into a text box? Could I differentiate my lessons for the needs of children who can’t read at all, don’t want to sit down, want to sit down but not with him, mustn’t be near a window, can read Kafka, have to work in groups, don’t like to talk to humans? And then I met Jack. Three weeks into the new term and, for once, my Year 9s were lined up outside the classroom. I call it a line, it was more of a bundle. Our Head of Department glided towards me, apology seeping from her smile. In the Year Nine line, Serena was painstakingly applying purple nail polish to Tyler’s not-quite-uniform black denim trousers. From nowhere, Samuel Beckett’s mantra came to mind. I collected myself and warned the students. Jack was everything a teacher could wish for in a disruptive pupil. He irritated others to the point of shouting. He swore. Made offensive jokes; stared into the void when it was time to write. Jack walked on desks. I battled with him. It didn’t take a counsellor to sympathise with the outrage in his defiance but peace was required if anyone was to learn. In training, teachers are shown methods to deal with difficult behaviour. These involve setting boundaries and sticking to them. The trouble is that human beings are unique and adaptable. Happy children are pretty much one, but misery has many faces. With Jack, I couldn’t keep up. I tried reward schemes, zero tolerance, profound tolerance, exclusion, inclusion, role-play, smiling, frowning and counting. I even summoned creative visualisations each time he entered the room. Jack loves English, I conjured desperately to myself, imagining studious reading and turn-taking. The class love Jack, I repeated under my breath. But they didn’t, and Year 9 English became a terrible war where the casualties looked on miserably as nobody learnt a thing. A change occurred one afternoon in the form of ‘Junk’; ostensibly a novel about drug addiction. Whisperings about its content had already begun in Year 8. If Jack’s mother had known what we were reading, he would, by parental order, be back in ‘Remove’. Jack’s mum had bound him so tightly to her own unhappy view of the world that school had become Jack’s only outlet to act up. And boy did he use it. I perched on my desk while the students held their tattered copies of ‘Junk’. Braced for mutiny, I read them into the writer’s world using every voice I knew. There are few things like communal reading. Thirty thirteen year olds suddenly stopped talking. Nothing like this had happened all term. A break from Jack’s campaign, a space for everyone in the room. It was the prose which drew them in. ‘Are we reading today Miss?’ They chorused upon entering the room. Soon I was using it as a carrot to urge them through Literacy and Timed Assessments. The focus changed .The swearing stopped. So did the table running and the ceaseless asides and while Jack did not become less angry, he realised, quite suddenly, that English wasn’t so bad. 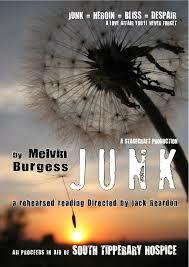 ‘Junk’, I realised, is not really about drug addiction at all. It’s a treatise on connection. The power of relationship. Burgess seemed to remember what mattered, had found a way into the minds of the young and even Jack, especially Jack, was right there with him. At the end of the year, my maternity cover was done and I left. Jack presumably joined Year 10, went on to Year 11. And then, one afternoon, I was in my front garden and he sauntered past, grinning, suddenly lanky. He lived in my area. He could see me wondering why he wasn’t in school. Of course. It was June. ‘Not long now,’ I jostled, expecting complaint about the GCSEs. ‘Miss, I have to tell you,’ he faltered, ‘I’ve been put in Higher English; I’m predicted an A.’ He gave a rare and tentative look, a smile, like Spring sunshine. And then he loped off. I wanted to climb the nearest tree and sing. A book may be many things to a child. A hint at what is possible. Comfort in a parallel place. A pact between writer and reader to be present for the other. Solid relationship in a world of change. Seems a long time since DELTA in London. I’m in York now but working for a company based in Brighton. My title is a very grand-sounding ‘Academic Head’. However, I’m still a teacher at heart. This story resonates with me greatly, it’s why we do the jobs we do I’m sure. It only takes one success story to make the whole year/course/lesson seem like a triumph. I’m currently teaching nurses to negotiate the IELTS exam in order for them to come to the UK and work for the NHS. I see you are in Oman – now there’s a prediction I couldn’t have made in 2008.